Our salmon fishing guides are friendly, experienced and professional, not to mention among the top BC salmon fishing guides coast wide. At Pacific Angler our fishing guides do just that; guide full time, 12 months of the year, are respected as some of the best in the business and have been featured in multiple magazine articles and TV shows. These guys are “highliners” in every sense of the word, putting fish in the boat when most are having a tough day. They are passionate about fishing and providing their clients with a fun, safe and productive day. All our fishing guides are Transport Canada Certified and have their SVOP, MED A3, ROC-M, Marine First Aid, and are members of the BC Sportfishing Guides Association. Eddie began his guiding career in 1985 and is a sought after seasoned guide. 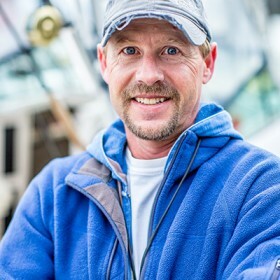 With over 30 years of Vancouver fishing experience, he’s an expert on the local waters and has built a large base of repeat guests who fish with him season after season after his many years here at Pacific Angler. Eddie also enjoys fishing for steelhead on the local rivers and fly fishing for trout on local lakes. Eddie is fluent in Spanish and has a working knowledge of Japanese. When not on the water, either guiding or personal fishing, Eddie is busy keeping up with his wife and his two daughters! Jason grew up on the banks of the Nickomekl river and at a very early age his passion for fishing was obvious. 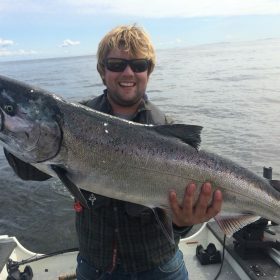 His uncle and grandfather nurtured that passion by showing him the ways of the saltwater world and Georgia Strait coho in the mid 80’s and 90’s. From that point on saltwater fishing was in his blood to stay. 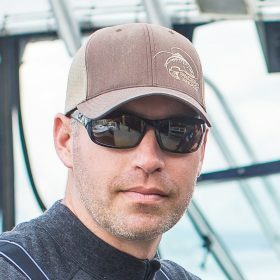 Jason has guided for salmon in Rivers Inlet, Hadai Gwaii, and Dundas but for the last decade plus has focused on the local waters of Vancouver, enjoying the challenging but productive waters he calls home. When not on the water Jason is at the shop selling tackle or teaching the Mastering Local Saltwater Salmon Course. On his days off he likes to get away to fish for steelhead on the Thompson and Dean and makes his yearly trip down to Cuba for bones, tarpon, and permit. Thomas is originally from the UK and spent much of his younger days in South East Asia. He’s always liked fish which naturally led to fishing, something that became an obsession after moving to Canada in his early teens. At 15 he worked as a deckhand at a northern fishing lodge in Haida Gwaii before progressing to guiding full time at 18. He’s fished at lodges in Haida Gwaii for over 10 seasons while fishing around Vancouver the rest of the year with his father. When not fishing, Thomas is a keen diver locally and internationally as well as working towards a commercial pilot license. From the high deserts of eastern Oregon to the rainy North Coast of Haida Gwaii, Khoi spent most of his life has been seeking ideal salmon, steelhead and sturgeon angling opportunities across the Pacific Northwest. 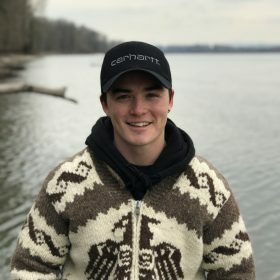 Khoi grew up exploring the variety of fisheries and salmon angling methods in Oregon and Washington specifically on the lower Columbia River and its tributaries. In 2012, Khoi moved to BC in search of new fishing experiences and to pursue and undergraduate degree. Khoi has spent the past several years guiding on the north and west coast of Haida Gwaii as well as several freshwater fisheries in southwest Washington. Khoi tries to spend as little time on land as possible however, his passion for fishing and fish management has moved him to pursue post-graduate studies in resource management at the University of British Columbia which serves to take up most of his free time off the water.